IIED visiting fellow Arif Hasan explores various planning alternatives for Saiban City. Which provides a more comprehensive but less polished account of the study. The fragmentation of the built-up area cities by the open spaces interpenetrating them is a key attribute of urban-sprawl, and sprawl as fragmentation, as distinct from sprawl as lower-density development, is now a universal feature of cities. 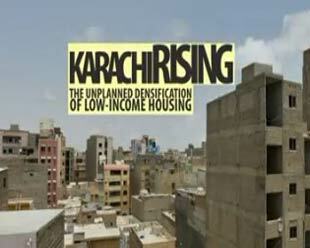 Karachi rising: The unplanned densification of low income housing. Traditionally, the poor in Karachi acquired housing on the outskirts of the city. With the rising cost of transportation and the difficulty of earining a livelihood on the periphry, the poor are increasingly driven to move closer to the city centre. This film examines the issue. Alternative routes to Urban Density presents a review of the settlements in Karachi that were studied, and summarises the main conclusions of the report on planning for high density in low-income settlements.